Standing at the giant snow-covered peaks is the most blissful feeling once can get in his/her life. But, along with the bliss, many mountains are life-threatening due to the technical and climatic challenges they possess. Some mountains have the treacherous weather condition with strong storms. While some mountains have cliffs that are impossible to climb. And, there are some mountains with risks of avalanches and rock falls in every single step. Considering these risk factors and the fatality rate in each mountain, here’s a list of 10 hardest mountains to climb in the world. Annapurna I – the 10th highest peak in the world tops the list among the hardest mountains to climb. Fascinating and equally dangerous – Annapurna rises to 8,091 meters in the Himalayas. Unlike Everest, it attracts only those mountaineers that are top on their game. Unfortunately, one-third of them never return. Annapurna I – the main peak in Annapurna massif has seen only 191 climbers conquer it. The deaths of 72 climbers on this mountain brings death rate to 38%. No other mountains in the world have such a high fatality rate. So, what makes Annapurna deadly? There are many technically difficult sections on the route. On the way to the summit, climbers have to walk right under unbalanced ice walls and seracs that may come down at any time. Annapurna has several avalanche-prone sections. Many climbers have died due to avalanches in Annapurna. On top of that, there are some tough sections where many climbers have died while trying to cross them. Many mountaineers have fallen to crevasses, or from the cliff on their way up or down the peak. The fluctuating climatic condition in Annapurna also makes this mountain hard to climb. Snowstorms can hit you any time. Sometimes climbers do disappear in the mountain because of low visibility. Moreover, at such a high altitude in the cold climate, climbers often suffer from medical problems like altitude sickness, pulmonary edema, and more. Inaccessibility and lack of enough local support also play some roles in making Annapurna hardest to climb as compared to other eight-thousanders. If you look at the mountaineering history, one out of every four K2 climbers never returned back. With such a high death ratio, this second tallest mountain has the second highest death-to-summit ratio. K2 offers deadly challenges with its extreme technicality. While around 500 reach the summit of Everest every year, K2 sometimes remain unclimbed an entire year. With a nickname “Mountaineer’s mountain”, only the elite mountaineers attempt to scale this mountain. The bad weather and avalanches in the K2 mountain can hit upon the climbers any time. The steep slopes make the climb technically difficult. To worsen the expedition, there are sections of rocks that may collapse at any time on climbers. The bottleneck is an infamous and deadly section on K2. The climbers have to travel across massive ice wall right beneath an overhanging glacier. The seracs are unstable and avalanches can occur at any time. All in all, K2 is among the most dangerous mountains. Some climbers put K2 above the Annapurna as the death rate on K2 has not decreased, unlike Annapurna. The avalanche is the major cause of deaths of most climbers on Nanga Parbat. Other major causes are falls and exposure to cold. Due to the extreme cold, climbers have never summited this mountain in the winter. The southern face of the mountain is the largest mountain face on this entire earth. Known as, “ Rupal Face”, this southern face of Nanga Parbat rises 15,000 foot tall from its base. An Austrian climber Hermann Buhl conquered Nanga Parbat in July 1953. But it was only after years of unsuccessful attempts and deaths of 31 climbers. Climbing world has suffered several disasters in Nanga Parbat- in 1895, 1934, 1937, and 1970. The latest tragedies occurred in June 2017 when two climbers went missing and January 2018 when a Polish climber died in the attempt. At present, the death rate on Nanga Parbat stands at 22 %. It is not the mountain only that poses threat in Nanga Parbat. The 2013 terrorist attack at Nanga Parbat killed 11 climbers. With all these past events, it’s clear why the climbing world referred this peak as the hardest mountain to climb. With the advanced climbing gears, the fatality of other mountains is decreasing significantly. However, Kanchenjunga is becoming more dangerous than it was before with the increase in the fatality rate. After 1990, the fatality-to-summit ratio in Kanchenjunga has increased to 20 percent. So, why is this mountain so dangerous? Surveying the death records in Kanchenjunga, we find falling as the major cause of deaths of climbers. So, the difficult terrain is one cause. But, there are so many other causes that make Kanchenjunga dangerous. Firstly, Kanchenjunga is too remote. It takes you around two weeks just to reach the Base Camp. So, you are already tired before you begin your climb. Besides these, the major danger lies on the mountain itself. There are many short technical climbs to do on the way. A few times, you have to walk right beneath overhanging glacier and seracs that may tumble down at any time. So, the avalanche is the major risk factor while trying to ascend this mountain. There are also very steep sections of 45°- 50° which make climbers nervous. Moreover, a steep section above Camp IV has taken lives of so many climbers while trying to return back from the summit. So, descending down from the summit looks more difficult than reaching the summit. To sum up, the bad weather, avalanche prone areas, and steep climbing slopes all play a major role in making Kanchenjunga one of the most dangerous mountains in the world. The most dangerous mountains are not always the tallest ones. With the height of only 3,970 meters from the sea-level, it is marked among the hardest mountains to climb in the world. Eiger stands over the small settlement of Scheidegg in the Bernese Alps. As compared to other huge mountains, it looks so small and is easily accessible. But, do not let the size and accessibility of the Eiger fool you- it is one of the most dangerous mountains in the world. The north face, also known as Nordwand, is a huge wall of shattered limestones. This 1800-meters high wall is the largest north face in the Alps. With the difficulty and hazard it posses, the climbing world calls it “Murderous Wall.” Many climbers have died while attempting to scale the Eiger through the Murderous Wall. The north face has several technical sections. Due to the melting of snow, there is a high risk of rock falls, ice falls, and avalanches. Many climbers have retraced back from a few hundred meters short of the summit due to rocks and ice falling on them. Swiss guides Christian Almer, Peter Bohren, and Irishman Barrington summited the Eiger for the first time in August 1858. Till now, more than 700 climbers have successfully attempted it. But, the mountain has claimed the lives of many climbers. Till now, more than five dozens of climbers have died on the northern face of the Eiger. Many of them were the elite climbers of their generations. Commonly known as “The Ogre”, Baintha Brakk is a steep and craggy mountain that lies in Panmah Muztagh, Pakistan. Rising to the altitude of 7,285 meters, it is a steep and rocky granite tower. Due to the steepness and rocky nature, it is among the extremely dangerous mountains. Yet, it lures the elite climbers. The south face of Baintha Brakk rises over 3,000 meters above the Uzun Brakk Glacier. Traversing through the ice slopes above the death valley is a huge challenge before the actual summit to the peak. Climbers often have to walk right under the unstable ice walls that could collapse any time. With a lot of technical difficulties with unpredictable weather and the altitude, Baintha Brakk remains a perilous mountain to climb. Baintha Brakk is not among the earlier-climbed mountains. Climbers in 1950s and 1960s conquered the toughest of eight-thousanders of Himalayas. But, it was not until 1971 that any climbers dared to conquer this giant. After two unsuccessful attempts in 1971 and 1976, two Britons summited Baintha Brakk, but the week-long descent was full of sufferings with broken legs, broken ribs, and pneumonia. Till date, there are nearly two dozens of attempts with only 3 of them being successful. These statistics show how hard climbing Baintha Brakk really is. Matterhorn is an iconic mountain of the Alps standing at the border of Switzerland and Italy. With its sheer beauty, it lures around 3000 mountaineers annually. As breathtaking as it is, Matterhorn is equally dangerous. Till date, it has taken the lives of more than 500 climbers. It was until 1865 Matterhorn remained unconquered. From then, climbers started rushing to summit this beauty. But, this challenging mountain has killed many climbers and the overcrowd also accounts for some of the deaths. Matterhorn is prone to avalanches and rockfalls which have taken the lives of many climbers. Besides, storms and bad weather have also caused the deaths of some climbers. Even the first ascent led to deaths of three climbers resulted due to the falls. Each year, there are about 12 deaths on Matterhorn on average. Although a large number of climbers have successfully summited this pyramidal peak, you cannot undermine the life-taking threats Matterhorn possess. Being the tallest mountain in Europe, Mont Blanc has the luring factor to attract thousands of climbers to its summit. 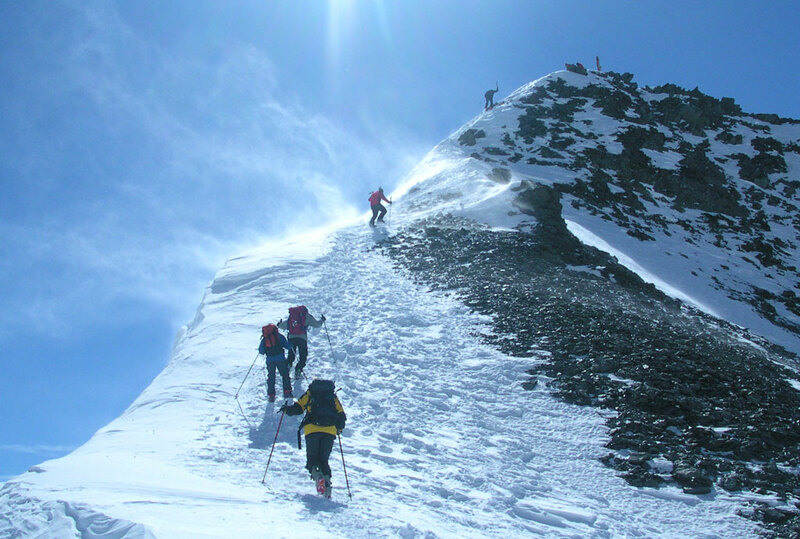 Due to its popularity, more than 30,000 mountaineers summit Mont Blanc. With this statistics, Mont Blanc expedition looks quite easy. But, the fatality record points it to become one of the hardest peaks to climb. In an average, 100 hikers die each year on the Mont Blanc. To tell the truth, Mont Blanc is not quite technical or too difficult. The human wave of experienced and inexperienced mountaineers is one of the causes of the high fatality rate in Mont Blanc. Mont Blanc gets crowds of more than 200 people on a single day during the peak season. With such a high number of climbers at the same time, some climbers get exposed to risks. Some sections of Mont Blanc are notorious to falling or rockfalls and avalanche breakdowns. The Le Gouter route passes through the ‘Grand Couloir” which is infamous for falling of rocks. At some sections, climbers have to climb near massive blocks of ice that can tumble at any time. Likewise, the “Grand Mulet” route exposes people to dangerous crevasses and deep cracks. In the warm seasons, the snowpacks soften and slide down creating avalanches. Moreover, the weather in the top of Mont Blanc is quite unpredictable and keeps changing. The top of Mont Blanc can still get extremely cold in the warm seasons too. The high wind of 60 km/hr can easily turn a normal situation to worst. So, in recent years, many climbers have died while summiting Mont Blanc. While most of them, however, are novice climbers. You must have guessed this tallest mountain in the world in this list. Although Mount Everest is not technically as hard as other mountains in this list, Mount Everest still remains as one of the hardest mountains to climb on the earth. Mount Everest has 1.4% of fatalities since 2000. The total deaths on the Everest are nearly 300. Rising over 8,848 meters from the sea level, Everest has an extremely cold and brutal climate. The section above 8000 meters called as Death Zone is an extremely dangerous section that has taken the lives of many elite climbers. At such altitude, the lack of oxygen and extreme cold numb your senses. Many climbers experience several medical issues like altitude sickness, pulmonary edema, heart attack, cerebral thrombosis, and more. When a climber experiences some medical problem at such high altitudes, it is impossible or at least too difficult to bring him/her back down to safety. This is why many climbers die on the mountain and their body remains there forever. The major difficulties in climbing Everest are altitude sickness, the extremely cold temperature, fluctuating weather, falls, avalanche, crevasses, and even the summit fever. Most climbers in the Everest have died due to avalanche, exposure, and falls. So, with many risk factors, Mount Everest remains as one of the hardest mountains to climb. Standing tall and proud to the west of Annapurna, Dhaulagiri is the seventh tallest mountain in the world. This peak also has attracted elite climbers from around the world. Till date, more than 73 climbers have died while attempting to conquer this majestic peak while more than 480 have reached the top. So, what can be the reason for such a high fatality rate on Dhaulagiri? Many deaths in Dhaulagiri are due to avalanche, along with the bad weather and high altitude. Several sections en route to the summit are prone to avalanches and objective dangers. Mountaineers were able to conquer Dhaulagiri on 13 May 1960. But, even after the first successful ascent, it took mountaineers more than a decade to summit this mountain the second time. Standing at the altitude of 8,167 meters, Dhaulagiri does not offer itself easily to climbers. The sheer faces, the isolated area, and the dramatic elevation rise en route to the summit makes Dhaulagiri a challenging mountain to conquer. These are among the most dangerous and hardest mountains to climb. Standing at the summit of these peaks is a lifetime adventure. However, it is challenging at the same time. So, before heading to one of them, make sure you have the proper mountaineering experience, logistics, mountaineering gears, determination, along with physical and mental wellness that these mountains require. Not just that, you need to choose the right time and right sets of people so that you won’t end up doomed in another mountaineering disaster.